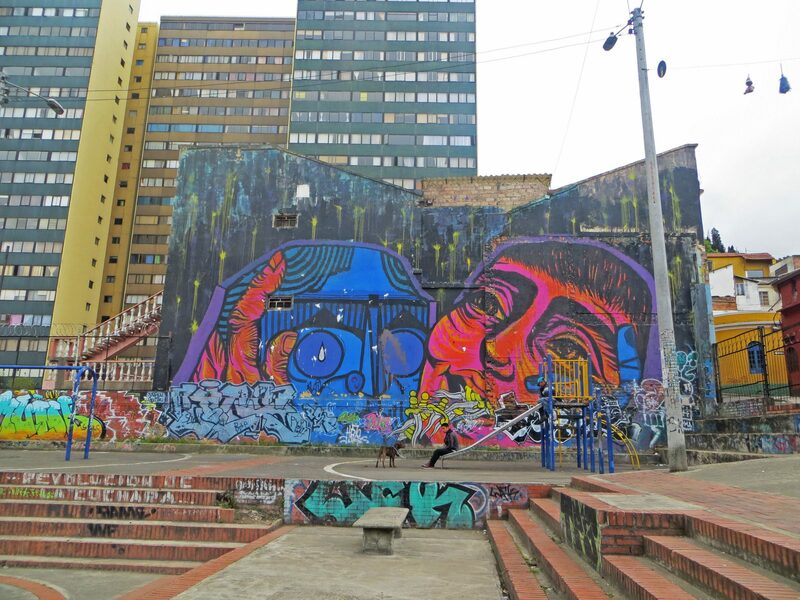 Bogota’s vibrant street art is a ‘must see’ on many travellers’ bucket list when visiting Colombia. A varied urban art scene has emerged since the decriminalisation of the practice in 2011. 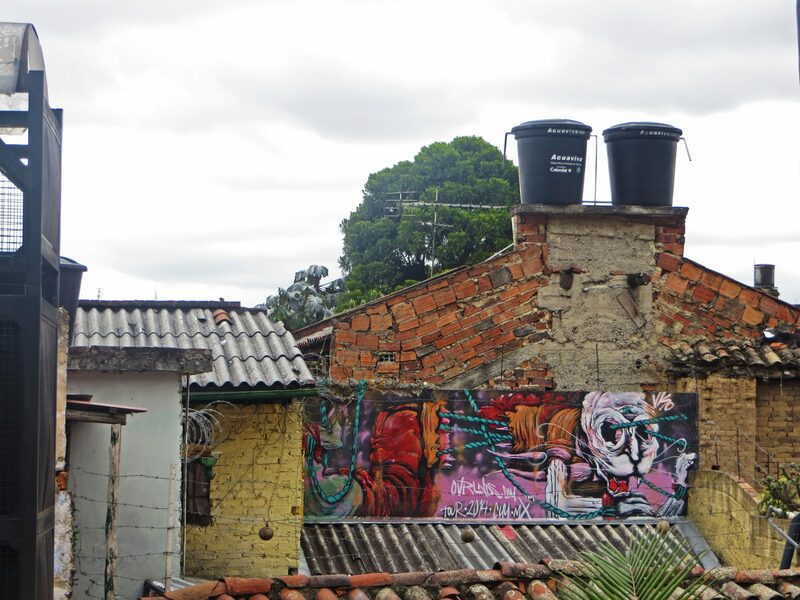 I took the popular Bogota graffiti walking tour to see the highlights. 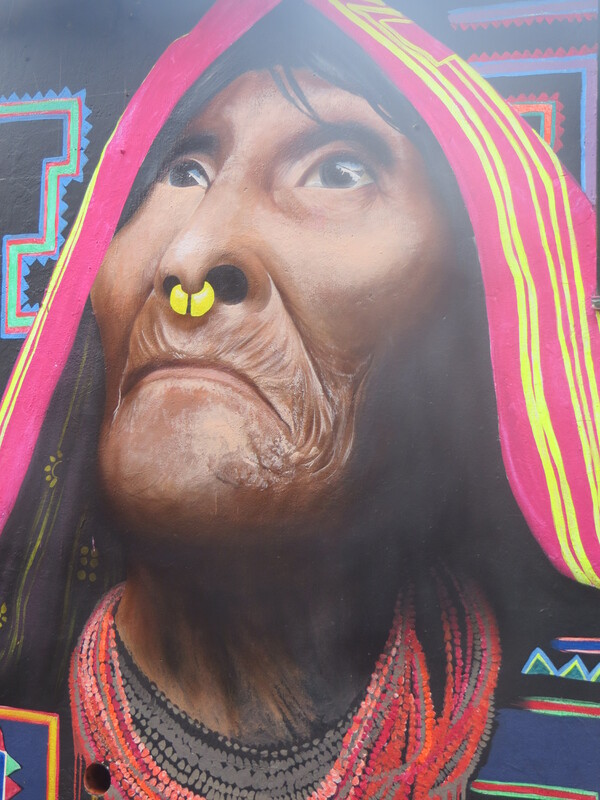 An indigenous woman by Colombian Street Artist, Carlos Trilleras. Standing by the statue of Simon Bolivar in Parque de Los Periodistas, I felt uncertain of what to expect of the next few hours. 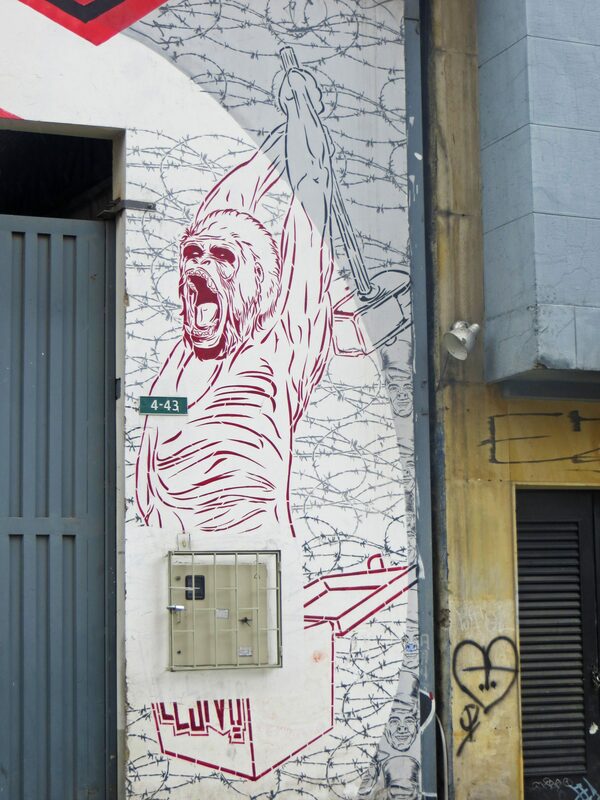 I’d arrived in Colombia late the previous evening and signed up for the Bogota Graffiti tour on a whim in the hope of seeing as much as possible in my short visit to the city. The sky was looking stormy, and the square seemed like a grey, concrete desert with graffiti tags scrawled around the statue. There didn’t seem to be anyone else around, and I started to wonder if the tour was real. Just as I was about to skulk back to my hostel for some hammock time, the enthusiasm of Aussie tour guide, Christian, burst onto a nearby pavement. A swarm of gringos gathered and within moments introductions had been made and a lively atmosphere ensued. The grey clouds of my weary brain had parted and made way for the anticipation of the hours ahead. 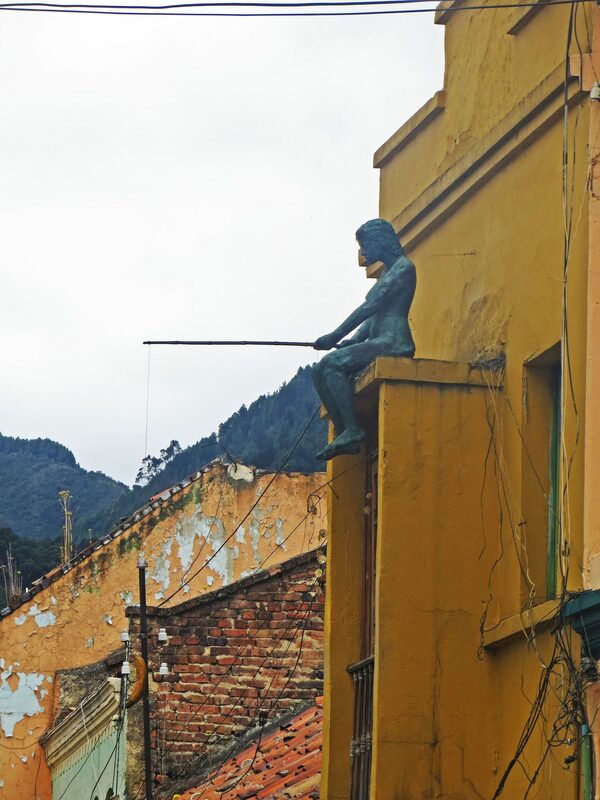 Despite being a backpackers’ haven in Bogota, La Candelaria can seem a little unappealing and even intimidating at first glance. However, this well-established tour offers an ideal way for solo travellers to get their bearings when first arriving in the city. 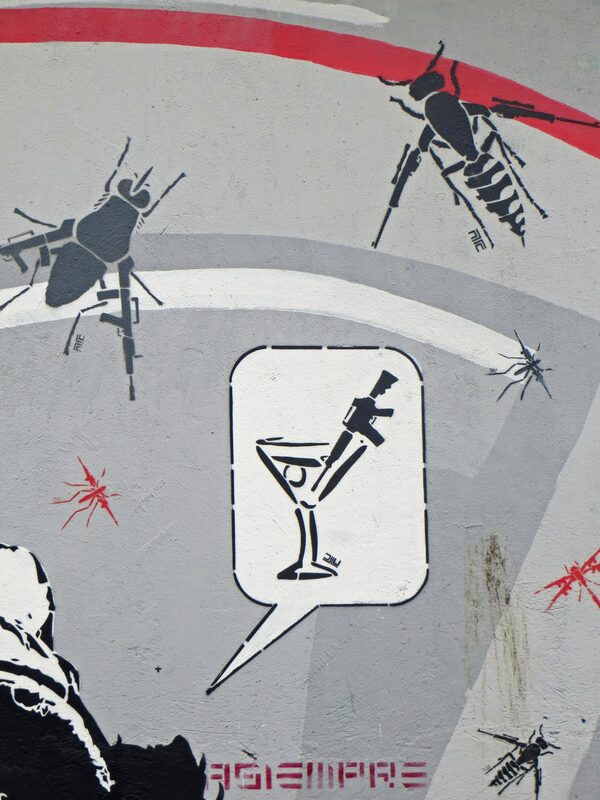 Plus, discovering more about a place via it’s street art can give a unique insight into the local culture. 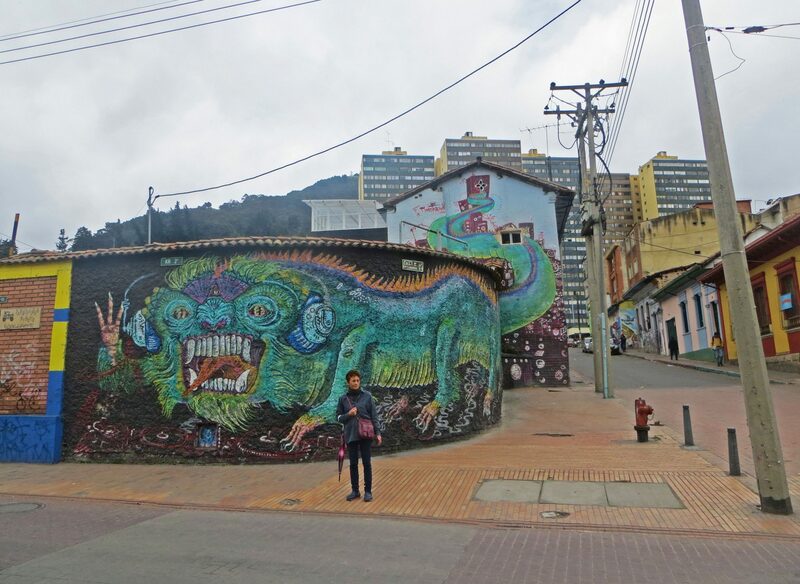 Chris is a resident street artist and his passion for the work in Bogota is clear as he shows us around. During the two and a half hours, I learnt about the history of the city, the politics and the lifestyle of the locals, as well as filling my memory card with colourful images. 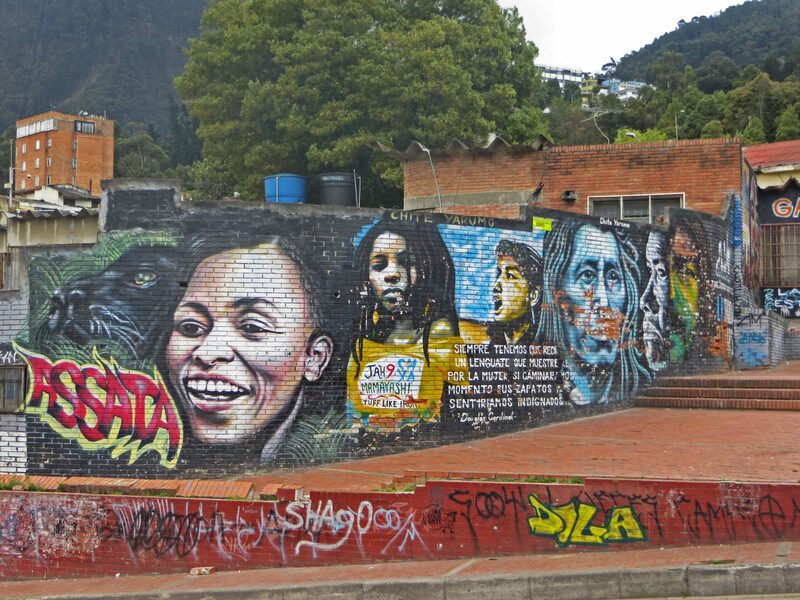 In 2011, police shot dead a 16-year-old street artist in Bogota. 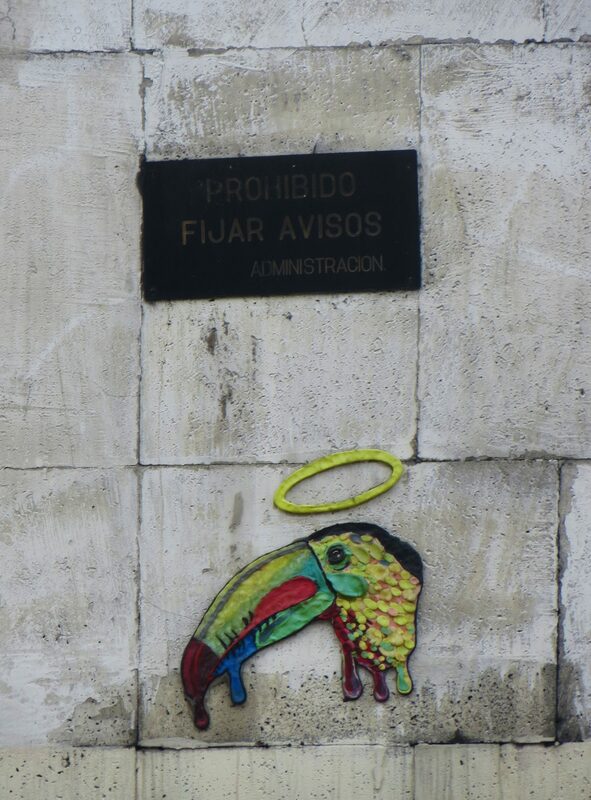 Outrage amongst the artists and locals fuelled a series of protests, which prompted City Hall to decriminalise street art. 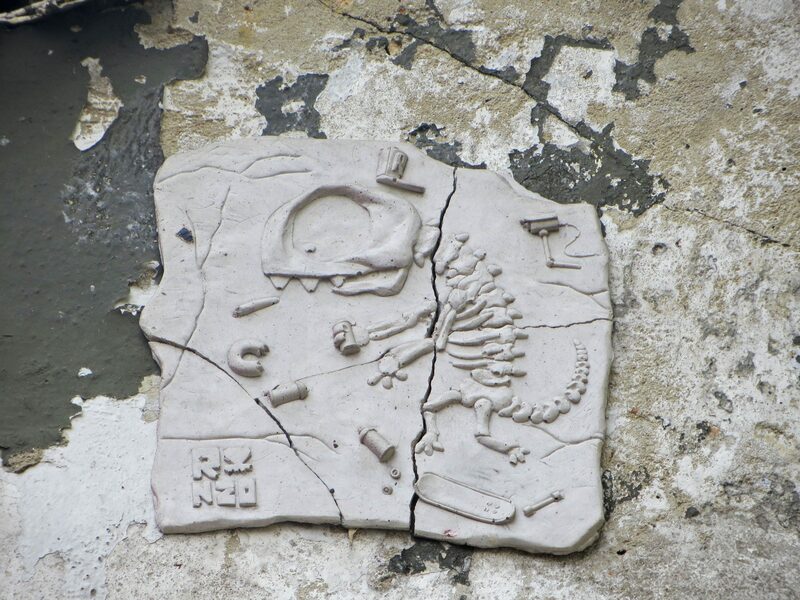 This put an end to a historical conflict between police and the artists. 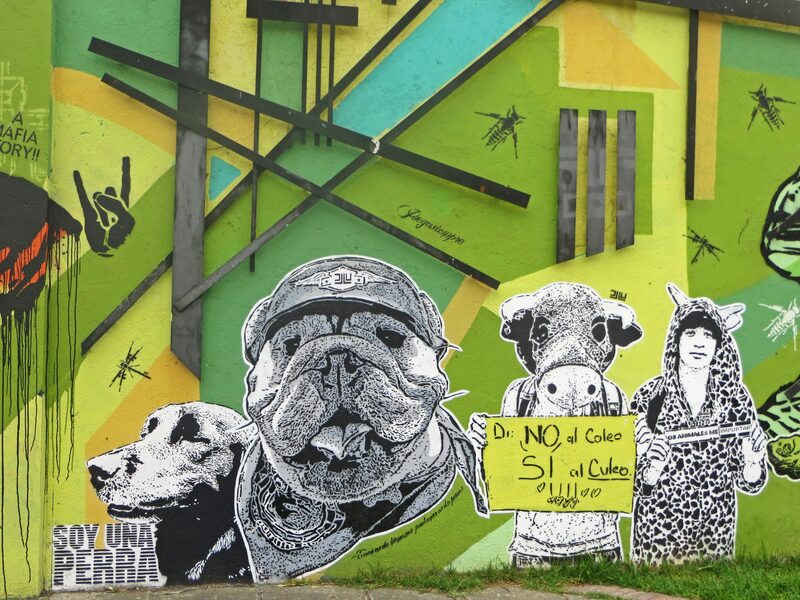 Bogota’s vibrant urban art scene has since grown, attracting artists from around the world. Legalisation means artists can create huge, intricate pieces of work without fear of getting moved on or arrested. They no longer need to paint in the middle of the night, and can work openly during the day. 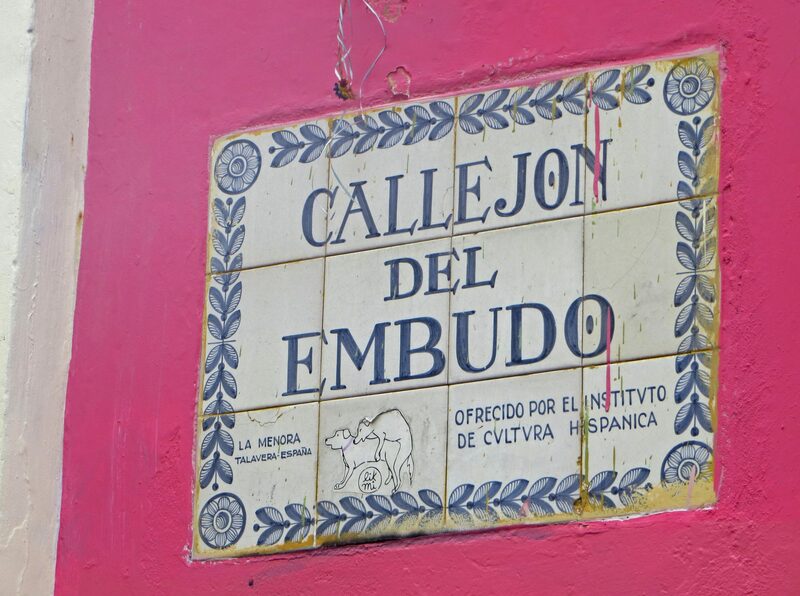 Shop fronts are adorned with wild animals, passageways embellished with sculpted characters and previously grey walls are alive with colour. It’s become a huge part of the city’s identity. 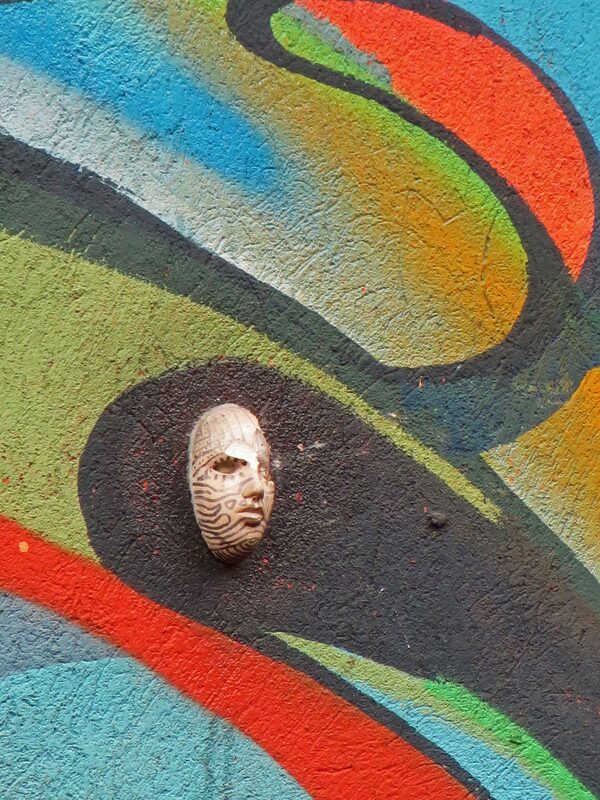 Masks with different patterns and colours are found on walls throughout La Candelaria. The distinctive halo circle shows these sculptures are created by the same artist. Sculpture by London Street Artist, Ronzo. Hanging out in the playground. Mythical beasts wander down the street with you. Faces beam out from brickwork. The bleakest of walls are brightened by street art. 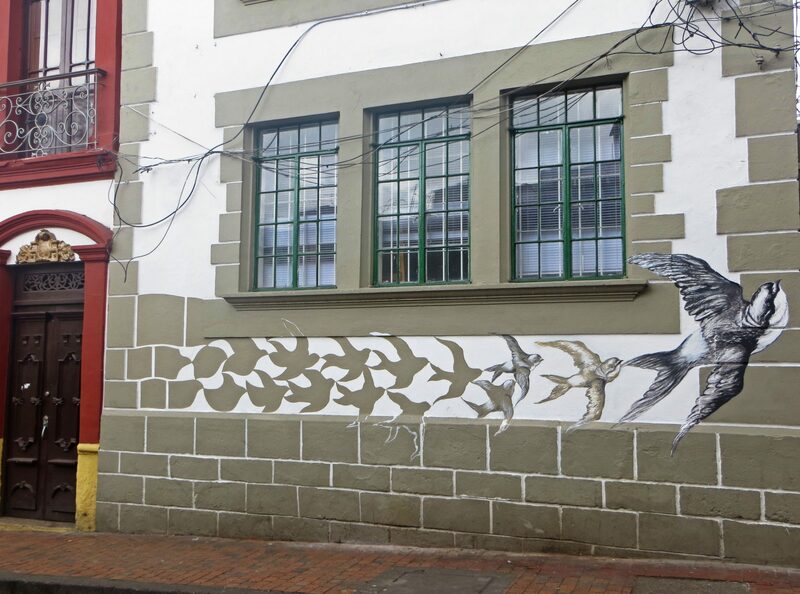 Father and son street artists, Rodez, Nomada and Malegria work together to create murals. Many murals are politically charged. 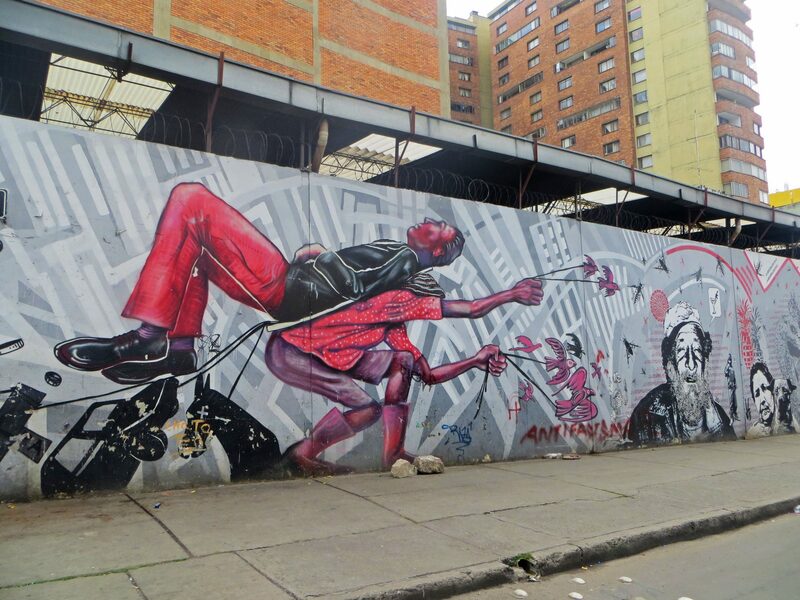 This is by Colombian street artist DjLu. Many shops and residents commission works on the side of their property to avoid tagging. Tagging is where artists sign their name/ signature on the wall. Artists avoid tagging over other artists’ work, so there are benefits to having a mural on your wall. You could easily miss these frisky dogs by street artist, Lik Me. She creates paper labels and sticks them on signs around the city. Many well known artists are keen to show in Bogota. 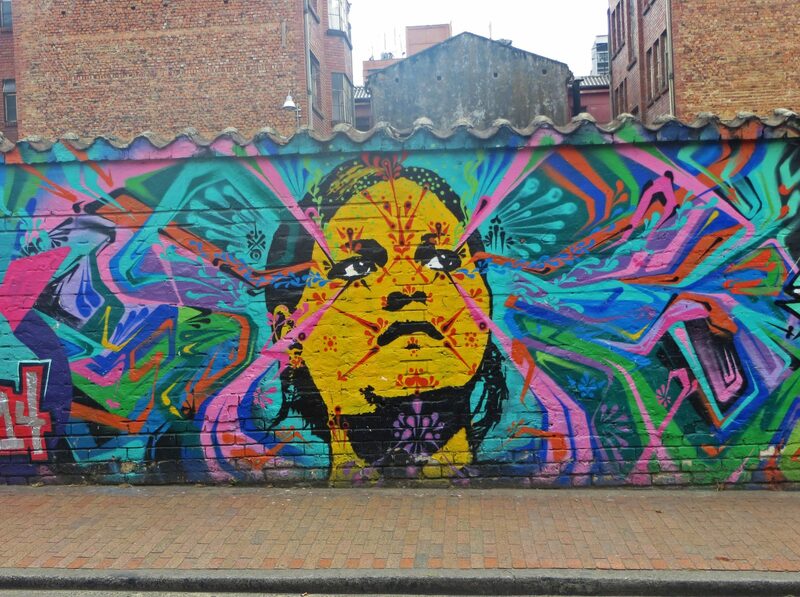 This is by Stinkfish who grew up in Bogota (born in Mexico). Have you been to Bogota? 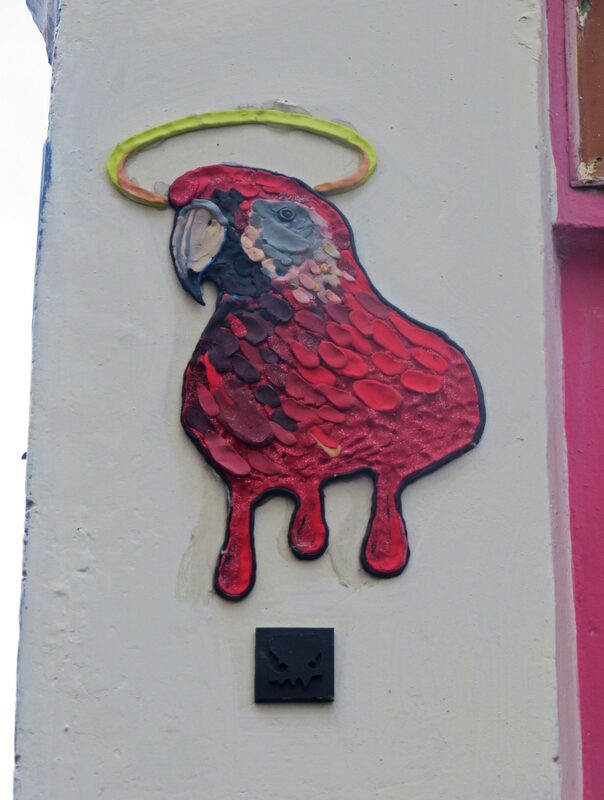 What was your favourite piece of street art? 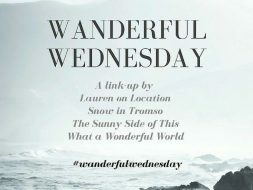 This post is part of the Wanderful Wednesday blog hop! Meet the hosts: Lauren of Lauren on Location, Van of Snow in Tromso, Isabel ofThe Sunny Side of This and me, Marcella of What a Wonderful World. It is awful – the story was that there had been violence between the police and the artists for a while and then this incident brought it all to a head. Terribly sad and bitter sweet when looking at all the wonderful art there is now! Wow those murals look so powerful! I wish we had more street art where I live! I know what you mean! 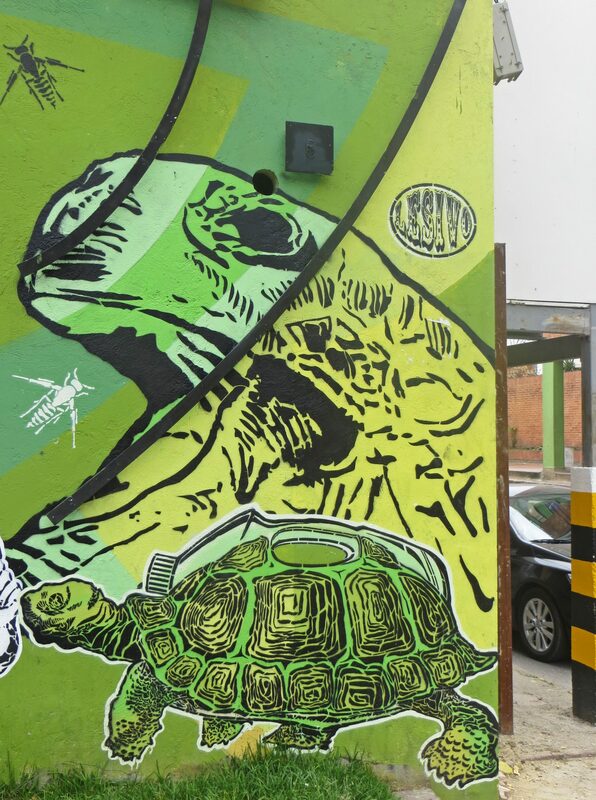 Parts of South America are just full of beautiful murals and I miss that back in the UK! These look incredible!! The colours and the designs are just beautiful 🙂 I reaaaaaaaally want to get back to Colombia ASAP, I loved it so much! I didn’t make it to Bogota, but this is just another reason why I should!